3.1 This chapter examines Internal Dispute Resolution (IDR) procedures and one External Dispute Resolution (EDR) scheme known as the Financial Ombudsman Service (FOS). 3.2 Australian credit providers are required to put in place a dispute resolution system consisting of internal review procedures, known as internal dispute resolution or IDR, as well as membership of an external dispute resolution scheme. Consumers can submit a complaint to their bank through the bank's IDR procedures. If the consumer is not satisfied with the response received from their bank, they may then submit a complaint to the EDR scheme to which the bank belongs. There are two main EDR schemes that have been approved by ASIC under the National Consumer Credit Protection Act 2009, the Financial Services Ombudsman (FOS) and the Credit and Investments Ombudsman (CIO). These two schemes are discussed in further detail along with other dispute resolution arrangements in Chapter 4. 3.4 In this report the committee has largely considered issues related to banks as the committee only received limited evidence in relation to the customer owned banking sector. The committee notes however, that where it makes recommendations to improve the dispute resolution system, its intention is for those recommendations to apply to all authorised deposit taking institutions (ADIs). 3.5 The committee received limited evidence during the inquiry from submitters regarding IDR procedures in banks. However, because the majority of the evidence received by the committee concerned disputes with banks, the committee examined the IDR procedures that banks have in place. 3.6 ASIC Regulatory Guide 165 requires banks to have IDR procedures that meet the standards or requirements approved by ASIC. When approving standards or requirements for IDR procedures, ASIC is required to take into account Australian Standard AS ISO 10002–2006 Customer satisfaction—Guidelines for complaints handling in organisations. 3.7 ASIC considers IDR to be an important and necessary first step in the complaints/disputes handling process because it gives lenders the opportunity to hear borrower concerns and address them genuinely, efficiently and effectively. ASIC considers that addressing complaints or disputes through IDR can also assist in improving business systems and products/services, which is integral to growing a successful business. 3.8 ASIC advises banks that wherever possible, they should seek to resolve complaints or disputes directly with borrowers through IDR procedures. It is better for all parties if a complaint or dispute is dealt with at the earliest possible stage because it prevents complaints or disputes from becoming entrenched, preserves customer relationships, is efficient and cost-effective and may improve customer satisfaction. 3.9 ASIC Regulatory Guide 165 requires that both retail and small business customers are covered by IDR procedures. As a minimum, any IDR procedure for financial service providers must be able to deal with complaints made by 'retail clients', as defined in section 761G of the Corporations Act and its related regulations, and this includes small businesses. A small business is defined in s761G as a business employing fewer than: (a) 100 people (if the business manufactures goods or includes the manufacture of goods); or (b) 20 people (otherwise). 3.10 FOS indicated that, in its view, IDR arrangements provide the cornerstone for effective consumer redress mechanisms in the financial sector. The vast majority of consumer issues are resolved by financial services providers directly with their customers. The FOS argued that research shows the way in which financial services providers deal with problems when they occur is crucial to gaining consumer trust and confidence. 3.11 The Australian Banker's Association (ABA) noted that small business customers have access to IDR procedures with their bank. The ABA argued that in many cases, the complaint will be resolved internally by the bank with no further action required. If the dispute cannot be resolved expeditiously, the small business customer is able to lodge the dispute with FOS. 3.12 ANZ informed the committee that it reported three breaches of the internal dispute resolution requirements under the Code of Banking Practice to the Code Compliance Monitoring Committee (CCMC) in 2014–15 and six in 2013–14. Two of these breaches in 2014–15 were self-identified and one was raised with ANZ by the CCMC. None of those breaches related to matters before this inquiry. We also have an area called NAB Assist which works with customers who have impaired files. So customers that are facing hardship can absolutely avail themselves of the services within NAB Assist. Should they have an issue with the way in which a file is being managed, they can also work with NAB Resolve to have that worked through in a different scenario if they are not happy with the way in which that file has been resolved. NAB Resolve is a separate function so it is a separate team from my frontline team where the bankers work. It is a separate independent function and has the ability and capacity to make decisions on any agreement that might be reached with those customers that are in dispute. 3.14 The Commonwealth Bank's IDR procedures state that the bank will provide a final response to the complaint within 45 days and that most complaints are resolved within a few days. 3.15 In addition to its complaints handling procedures, Westpac has a customer advocate service for complaints that are not properly resolved or handled. 3.16 The committee noted with some concern results that the CCMC has published based on self-reporting of breaches of the Banking Code of Practice by banks. Under the CCMC Annual Compliance Statement program, banks are required to self-report areas of non-compliance with the Banking Code of Practice and share information with the CCMC about how they intend to improve compliance. 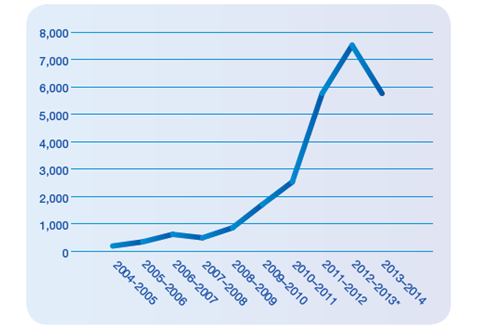 The figure below shows the number of self-reported breaches between 2004 and 2014. The CCMC also reported that for the 2014–15 financial year, there were 6558 self-reported breaches, an increase of 14 percent on the previous year. Source: Code Compliance Monitoring Committee: 2013–14 Annual Report, p. 7. 3.17 Prior to the GFC, banks self-reported several hundred breaches of the Banking Code of Practice per year. The number of breach reports has now grown to 6000 to 7000 per year. 3.18 The CCMC reported that for internal dispute resolution in 2013–14, banks self-reported 91 breaches of the relevant clauses of the Code. In 2014–15 annual report the CCMC indicated that self-reported breaches of internal dispute resolution obligations rose to 536, a 523 percent increase relative to 2013–14. The CCMC reported that one bank accounted for 65 percent of the 536 breaches. 3.19 In relation to complaints lodged by customers in 2013–14, banks recorded 1.1 million disputes in total, a year–on–year increase of 53 per cent. One bank accounted for 73.8 per cent of all disputes recorded. The CCMC reported that in total, banks recorded 1 226 093 complaints in 2014–15, an 11.5 per cent increase on the previous period. 3.20 The committee has not examined the breach reporting in further detail and has not sought to identify the banks responsible for significant issues relating to the total number of disputes and IDR. However, the figure and discussion above indicate to the committee that problems exist with banks' IDR procedures. These problems add weight to the committee's view that EDR schemes need to be strengthened, as discussed later in this and the following chapter. 3.21 This section summarises evidence provided by submitters in relation to EDR schemes, including FOS. The issues raised relate to the jurisdiction of FOS, the independence of FOS from the banks, the fragmentation of EDR schemes and the inability of borrowers to use the court system. where other processes such as mediation had been used, FOS may then be excluded from considering the matter. 3.23 A submitter alleged that the FOS is so severely restricted by its terms of reference and the CCMC by its constitution that the two organisations fail to investigate all but a very small percentage of customer complaints. The Tasmanian Small Business Council agreed with this assessment, and further argued that a decision of the FOS cannot be challenged. 3.24 The committee considers issues related to the limits of FOS' jurisdiction later in this chapter. Because of the financial limitations with people who are in financial difficulties, clearly it is the role for FOS powers to be expanded to investigate those particular issues. FOS has the knowledge and experience to manage those types of matters and to make reasoned decisions binding on both parties. If there was even that option available, I am sure it would be a catalyst for the banks to act more fairly and reasonably in certain circumstances. The terms of reference of some industry bodies (such as FOS) do not focus or allow for access by some category of borrowers. It is recommended that an authority with power to resolve matters between the lender and borrower be established with the fall back to the legal system. This authority should be staffed by generalists, some with knowledge of law but importantly persons that understand both sides of the lender/customer relationship. The authority should be empowered to make the final decision on disputes. Consolidation of current relative institutions should be considered. ...you go to a residential tenancy tribunal. They talk about it and give the guy a bit more time and give you a few more months and they work it through and hopefully resolve it. But with a small business guy, a bank can move in and can not only kick him out of the house but will also take the house and sell it, take his holiday house and sell it, take his cars and his jewellery and all of his assets—all of that stuff. The bank will do all of that and they will not even have sold the property that the loan is secured upon. I am saying we need something like a residential tenancy tribunal so that when a genuine event of default occurs, it gets referred to a third party who then review it. 3.28 The Tasmanian Small Business Council suggested that the IDR procedure and EDR scheme of the Australian banks should be reformed so that small businesses, farmers, and individual customers can have complaints arbitrated quickly, cheaply, and fairly. 3.29 The section discusses the FOS, its history, jurisdiction and functions in relation to consumer protections. That was the original banking ombudsman scheme—the Australian banking industry ombudsman. It was later renamed the banking and financial services ombudsman during 2000 or so, and it is now an aggregation of three separate external dispute resolution schemes formed into one dispute resolution scheme. It now covers general insurance and financial services matters like financial advice and so forth. 3.31 As a condition of their licence, credit licensees must join an ASIC-approved EDR scheme such as FOS and the CIO. 3.32 Treasury informed the committee that while determinations made by FOS are binding on credit providers, FOS' decisions are not binding on the complainant. As such, customers are free to seek recourse through the court system should they be unhappy with the EDR process. Treasury indicated that there are no reforms to the consumer credit laws currently being considered. 3.33 This section sets out some of the disputes that FOS can consider. 3.34 A financial services provider in possession of a borrower's property must take reasonable care to sell the property for either its market value or the best possible price. If FOS believes the financial services provider in a dispute did not take reasonable care, FOS may award the borrower compensation for any difference between the sale price and the market value of the property. 3.35 FOS considers that financial difficulty occurs when a consumer is unexpectedly unable to meet their repayment obligations. This can be the result of a variety of causes including accident, separation, death of a family member, unexpected medical or funeral expense, reduction of work hours, redundancy or a downturn in business. 3.36 When a consumer cannot make their loan repayments, they may claim their financial services provider should not have given them the loan because they never had the capacity to repay it. The consumer may lodge a dispute with FOS seeking compensation for a loss resulting from provision of the loan. FOS refers to this as a "responsible lending" dispute. When FOS considers responsible lending disputes, FOS decides whether it was appropriate for the financial services provider to enter into the loan. 3.37 The committee was informed that responsible lending issues also arose in relation to how farm loans were originally negotiated, including the findings of a study on regional farm debt that found that more than 20 per cent of respondents reported that bank managers completed their budgets and offered loans larger than expected. A receiver may have been appointed to a company before it lodged a dispute with FOS. At law, a receiver acts as an agent of the company, not the creditor who appointed the receiver. As the receiver is in control of the company at the time of lodgement, the receiver must consent to the dispute being lodged. Similarly, if a liquidator has been appointed, then the liquidator's consent is required. FOS can consider disputes where legal proceedings have been issued by the financial services provider against the borrower, provided those proceedings have not gone beyond lodging a defence and counterclaim. If they have gone beyond that stage, FOS cannot consider the dispute. If a borrower is a small business and one loan exceeds $2 million FOS cannot consider the dispute as it is considered that a court could more appropriately deal with the matter. The $2 million limit was introduced on 1 January 2015. Thirteen disputes lodged with FOS since that date, have exceeded the limit and FOS has therefore not considered those disputes. FOS can only consider a dispute where the amount of the claim (the amount of loss) does not exceed $500 000. The maximum compensation FOS can award is $309 000. The amount of loss is not necessarily the amount of the loan, as often the borrower repays the principal and at least some interest. Where a guarantor owes more than $309 000 and seeks to have the guarantee set aside, a court is a more appropriate place to consider the dispute. This is because a guarantee cannot be set aside in part. It is either valid for the amount or it is not valid at all. FOS cannot consider a dispute where FOS has already dealt with the subject matter. For example if FOS issued a determination which the customer did not accept, FOS will not look at a new dispute about the same matters. 3.39 This section summarises the jurisdiction of the FOS in relation to small business and commercial loans. Because the National Credit Act does not apply to loans for business purposes, lenders that do not provide consumer credit are not required to hold an Australian credit license and are therefore not required to belong to an EDR scheme. Where a lender is a member of an EDR scheme, whether on a voluntary basis or because they provide regulated consumer credit, the EDR scheme may consider small business disputes. An EDR scheme's ability to consider small business disputes relating to lending is not based on any legislative requirement but is limited to the general consumer law, existing voluntary codes of industry practice and by the monetary value of the claim. 3.41 The Senate Economics References Committee inquiry into the post-GFC banking sector recommended that the terms of reference of FOS be amended so that FOS may consider disputes from small business applicants where the value of the claim is up to $2 million, and that the cap on the maximum compensation that FOS can award be increased to $2 million when the dispute relates to small business. 3.42 The FOS informed the committee that when the Banking Code of Practice was first introduced in 2003, the jurisdiction of the ombudsman's office was increased to cover small business cases. When the National Consumer Credit Protection Act 2009 commenced in 2010–11, FOS still had that broader jurisdiction, even though the regulation does not cover it. If an organisation joins FOS, their small business products are covered as well. FOS has accepted disputes where farmers have rejected or withdrawn from mediation process, except where mediation is legislatively mandated. 3.44 The 2013 review recommended that FOS should be more active in using its jurisdiction to reject large complex commercial disputes and publish guidelines about how it will use its discretion. 3.45 The review also led to recommendations focussed on the need for FOS to increase the pace of its current efforts to eliminate dispute backlogs and reshape its dispute processes to reduce the time taken to resolve new disputes. This limit is aligned to the retail client definition as set out in the Corporations Act: s761G(7)(a) and regs 7.1.18–19. Approved schemes also operate a compensation cap which is the maximum amount a scheme is able to award in compensation to a retail client. Until 2012, the compensation cap for most complaints about credit and financial services was $280,000. RG 139 requires that the compensation cap be increased every 3 years. Therefore, on 1 January 2015, the cap increased from $280,000 to $309,000. RG 139 requires that EDR scheme coverage under the Corporations Act and National Credit Act must be sufficient to deal with the vast majority of consumer complaints or disputes in the relevant industry, up to the jurisdictional limit of $500,000. 3.47 FOS informed the committee that it considers the 2013 Code of Banking Practice to represent good industry practice and generally reflects the common law obligations of financial services providers. Financial services providers can subscribe to the code and, once they subscribe, they are required to comply with the code. 3.48 ASIC informed the committee that it is intended that high value and complex disputes of a more commercial character are excluded from the jurisdiction of the schemes. The level at which jurisdictional limits and compensation caps are set affects all industry participants providing financial services to retail clients and will have particular implications for EDR scheme members who require professional indemnity insurance to meet any claims. 3.49 The current FOS terms of reference now include an extensive list of over 20 exclusions from FOS's jurisdiction. As noted earlier, financial exclusions include that FOS may not consider a dispute where the applicant's claim in the dispute exceeds $500 000 or about debt recovery against a small business for loans over $2 million. There are also limits for small business of 20 employees (or 100 for manufacturers). It depends on the institution. They all sort of go through peaks and troughs—they get better at things and then they drop the ball. In consumer cases involving financial hardship, banks and other financial services providers have vastly improved the way they deal with their customers. That has been driven by the code in the first instance and by the National Consumer Credit Protection Act more recently. What we are not seeing is the same level of improvement in relation to small business customers, yet the code obligation still exists. Even though there is no regulation about assisting small business customers in hardship, if you are a subscribing bank you do have that obligation and it does form part of the contract. 3.51 FOS informed the committee that of the small business disputes relating to credit (excluding credit card disputes) closed in the 2014–2015 financial year, 11 were excluded because they exceeded the monetary limits noted above. In eight of those disputes, the value of the claim exceeded $500 000 and the remaining three disputes involved debt recovery and a credit facility of over $2 million. 3.52 This section briefly summarises views put to the committee by banks and the ABA about the jurisdiction of FOS. 3.53 Changes to the Banking Code of Practice in 2013 (the Code) included a number of new provisions for small business lending. For example, banks are now required to give small business borrowers a reasonable period of notice (not less than 10 business days) in writing of a variation to terms and conditions of a credit facility, including a revaluation of the credit facility. The Code was revised to include more details on how banks must help clients, both individual and business, overcome financial difficulties through discussions and possible rearrangements. 3.54 In the former version of the Code, banks could vary terms and conditions without providing written advice in advance of the new terms and conditions taking effect. The Code previously did not include detail on how to help clients experiencing financial difficulties. The definition of that would be: anyone borrowing up to $10 million to $20 million would be what I would call the small and medium businesses. Anything beyond that, they are lawyered up. They have people who are very capable professionals; they have their accountants...I would say above that level you definitely have very capable people on the other side negotiating. We think that the current level is sufficient and has the right balance. We think that small businesses need more protection under this, and we think that the levels that they are afforded—the Financial Ombudsman Service, for example—at their level deal with the right size of customer to deal with that fairly and efficiently. If we start including that for broader, more well-resourced companies then I think that could get clogged and decrease the efficiency of that organisation. We will from time to time agree to hear matters outside of their limits where we think it is warranted. We have gone to FOS for matters that are above their limit where that has been appropriate, or where we have thought that is appropriate and the customer has agreed. We certainly do not have a formal position taken with our members on consultation on that. The fundamental principle underpinning the scheme was that it existed to deal with simple cases, disputes, that could be dealt with fairly readily on a no-cost-to-the-customer basis for the dispute. Where a review of the financial cap on the scheme goes, I guess it will need to be measured against the principle that it is for relatively uncomplicated matters. That is what the scheme was designed to do, and not necessarily to replace other tribunals or the court system for the more complex matters which perhaps are better dealt with by courts. We accept that there is an access to justice issue in all of this. 3.58 The committee has formed the view that small business borrowers are often just as vulnerable as residential borrowers as they may have been required to provide their homes or personal guarantees as security for their loans. The committee considers that the evidence in this inquiry demonstrates that it is no longer sufficient for lenders to small business to be voluntary members of EDR schemes. The committee therefore recommends that relevant regulatory changes be introduced to require lenders to small business to participate in an EDR scheme. that the ABA support the Commonwealth government's review of FOS. 3.60 The committee has recommended in chapter 2 the extension of responsible lending provisions to cover small business loans, closing of other gaps in coverage and a role for the ASBFE Ombudsman in leading and coordinating reforms including the review of the jurisdictions of external dispute resolution schemes including FOS. 3.61 This section discusses the time limits established by FOS' terms of reference that apply to disputes being considered by FOS. Some submitters raised concerns regarding FOS time limits. where, prior to lodging the dispute with FOS, the Applicant received an IDR Response in relation to the dispute from the Financial Services Provider—within 2 years of the date of that IDR Response. 3.64 However, FOS may still consider a dispute lodged after either of these time limits if FOS considers that exceptional circumstances apply. 3.65 The 2013 FOS independent review found that in 2012–13 there were 133 disputes rejected on the basis that they were outside the time limits. The review did not consider how many disputes were not raised because potential applicants became aware that their circumstances were outside the time limits. The review found that the timeframes should normally be sufficient, but that FOS should report on how it exercises its discretion to allow 'out of time' disputes to use a FOS service. 3.66 The committee notes however that the 2013 review did receive a joint consumer submission raising concerns that the two year timeframe from the end of the contract was quite limiting. 3.67 The committee discusses other EDR schemes and its recommendations for EDR schemes in the next chapter. FOS ruling in favour of the banks because it is funded by the banks. 3.69 The Tasmanian Small Business Council submitted that, in its view, in many cases the FOS does its job acceptably, however, there are continuing issues surrounding the independence of the FOS and its effectiveness in resolving customer disputes. ...the Code of Banking Practice is not an approved code by the ACCC or ASIC, under relevant legislation. It is a code that was introduced by the banks themselves, and it sits above the legal requirements that are imposed on financial services providers. The code itself has a provision that, where there is a requirement in the code that a bank needs to comply with that is greater than the legal standard, they will comply with the code rather than the legal standard, provided they do not get into a breach of the law if they do that. 3.73 This section summarises the funding arrangements that are currently in place for FOS, CIO and the CCMC. 3.74 FOS is funded by participating financial service providers through fees including an application fee, an annual user levy based on the size of the business and case fees for disputes handled by FOS. CIO is also funded by participating financial service providers through fees including application fees, an annual user levy based on the size of the business and service fees for complaints received by CIO. The CCMC is funded by annual bank subscriptions. The funding of the service is by charging fees and levies to the various financial services providers: banks, insurance companies, superannuation funds, advisers—fees for services. They are charged a levy based firstly on their size and then a separate levy based on the number of cases they have had in the previous year. Then, for each dispute that comes into the office they are charged a fee, depending on where the case closes in our system. The longer it takes to resolve and the further it goes, the greater the charge. 3.76 The committee notes that the funding arrangements that involve a levy that is dependent on the number of cases being raised with FOS for each bank provides an incentive for banks to follow good banking practices and where disputes arise, to resolve them effectively through their IDR arrangements. Explore the potential for the ASBFE Ombudsman as an independent body to also take over the role of compliance reporting and enforcement once the new ethical and professional standards are in place. This would allow the de-funding of the CCMC and funds to be allocated to the ASBFEO. 3.78 This section summarises views put forward by submitters about the difficulties associated with pursuing disputes with banks through the courts. 3.79 For disputes that are outside the jurisdiction of EDR schemes, such as FOS, the committee heard that many customers were prevented from taking legal action because they have lost control of their financial resources, or the cost of legal action excludes all but the wealthiest borrowers. In some cases the commercial nature of their business also rules out access to low cost legal services or Legal Aid. A number of submitters argued that the legal process is too costly for the average borrower. First of all they send in the receivers who clean out all of your assets and your cash resources so you do not have any money to fight. If you survive that, then they go for bankruptcy. The result of this is that an SME is unable to resist the will of a bank even in a court of law. The contractual balance of power between the bank and the customer has moved so far in favour of the bank in recent years that it is impossible for an SME to challenge a bank in court. 3.82 Another submitter suggested that any hope of legal redress or remedy has been extinguished by settlement deeds and prohibitively expensive court processes. The court system in Australia is closed to small businesses and individuals attempting to compel banks to abide by their own Code and regulations. The costs are prohibitive and the banks have vast resources at their disposal. The concerns outlined by the Martin Committee that the judicial system is unfairly weighted towards leading banks—whose resources far outweigh small businesses, farmers, and individuals—is as true today as in 1991. ...the Court is already dealing with disputes that arise out of LVR covenant breaches and should a bank or financial institution be accused of using a constructive default (security revaluation) process to impair loans the Court is the best place for such a determination to be made. ...the Court is a more than adequate forum for redress and mediation and that further legislation in this matter may potentially hamstring the ability of the Court to consider cases on their individual merits. 3.86 NAB noted that in some cases resources are available to challenge relevant decisions of the banks. The liquidator of a company has access to the Assetless Administration Fund and to litigation funding, so there is the possibility for liquidators to pursue action against banks if they form the view that the action is necessary, and NAB noted that there are examples of liquidators who have done so. 3.87 The committee wishes to acknowledge the evidence put forward by submitters in which there are many accounts of extreme financial hardship arising from loan contracts that require the borrower to bear all the risk. The power in the contracts is so skewed in favour of banks that the capacity of a borrower to protect their rights is very limited. In addition, even if a borrower can begin a legal case, their prospects of success are limited because of the capacity of banks to 'deep-pocket', out-spend and out-wait the borrower. 3.88 This section summarises allegations that have been made in the UK regarding EDR schemes and the accessibility of courts for borrowers in disputes with banks. The banks do have internal procedures for settling disputes. Some of the evidence received for this report does suggest these are not working effectively and the decisions made are not impartial within the bank...There is no 'stoppage time' within the banks once a complaint has been made so the activity which the bank is complaining about continues throughout. Evidence was even submitted of instances where the individual banker that the business has complained about has in fact run the internal complaints procedure against themselves. Rarely do these processes lead to an adequate resolution for the business and it is apparent that they need an external, impartial body to take a fair decision. However, the delays of going through this process mean that the business is in an even weaker position once they seek external support. Once a business has been put into administration, the business owner is no longer a director of the business and therefore unable to pursue legal remedies – only the administrator can do this. ...there is much concern that the administrators often have conflicts of interest and are in fact appointed by the bank, or at least on the advice of the bank, meaning there is little incentive for them to initiate legal proceedings. The business owner can then not take any action against what has happened to them unless the bank brings a case against them, for example calling in a personal guarantee, in which case the business can instigate a counter claim. At this point, it is worth bearing in mind that the business owner may be under serious financial strain as a result of the banks actions, possibly having invested personal money into the business prior to its collapse, meaning the cost of taking legal action is unaffordable for them. 3.91 Even if a small business or it owner(s) have resources to pursue a matter through the courts, access to effective legal representation may still be limited. The Tomlinson report noted that law firms that do business with banks may have clauses in their contracts preventing them from taking action against banks. As a result, the pool of lawyers available to advise and conduct cases for small business is limited. 3.92 The UK Financial Conduct Authority has indicated that it is examining the matters raised in the Tomlinson report and that it intends to report on its findings later in 2016.